It is time! time to mage-up and uhm time-up… never mind! 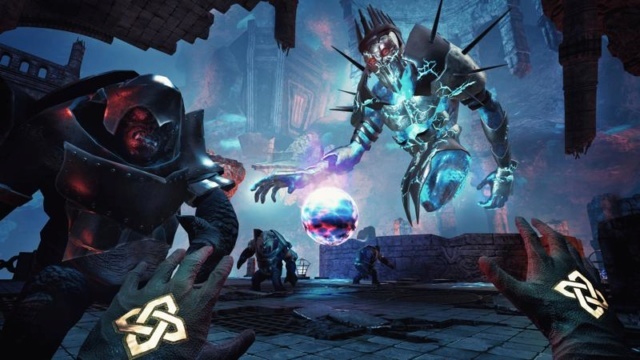 Ok here's our review for The Wizards: Enhanced Edition for the PSVR which is developed and published by Carbon Studios. 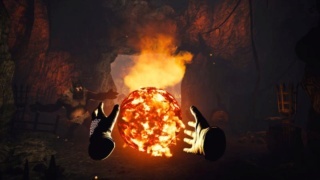 OK so the game starts you out as an apprentice of sorts wanting to learn magic from a wizard, but the wizard who speaks to you doesn’t have a body, so he begins with a small tutorial explaining the basic fireball spell and shield spell. After the tutorial is finished you get introduced to your study or hub world if you will. Basically you have 3 things you can do there. The main part which is a map were u chose the stage you want to go to, the table were you power up your spells and learn new one's. You can also test your spells as well. There's another table with a large sort of a sink? I'm not sure how to describe it, but it's basically water and a bunch of hands holding balls of colors and if you drop a ball into the water you can dip your hand and paint your hand the color you want for fun we guess. You also have a fireplace were you can burn a book just for giggles. 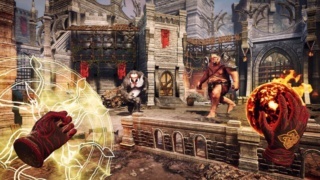 Also while you on the map choosing a stage you have the option to insert a card into the stage that changes certain things like enemies have more hp or enemies are weaker, you only start with a few but as you progress you will find chest with a new card in it basically to alter the stage for a more challenging experience. 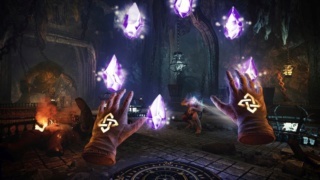 Now every stage has 3 hidden gems that you use in order to power up your spells and also depending how you fight you get scored on that but we honestly are not quite sure what determines a good score. In the end its just for a leader board thing, unless you’re into being number one on the leader board you don’t have to worry about that. Now regarding the story, we found it ok, but nothing that really wowed us. Basically you travel through time and save certain time periods from monster and some sorcerer who's casting an evil spell. The somewhat troublesome thing thar I noticed is that it’s a little bit too linear in the sense that there no monster around the map you just explore get trapped and have to beat monsters and survive in order to proceed, I was hoping for a little more interaction or to make it more lively but the stages continue same way, explore, get trapped, defeat enemies, continue. However we did find fighting bosses interesting. 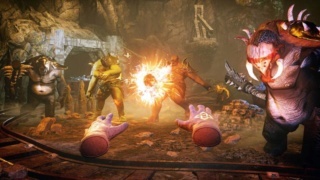 The game also has an arena mode, but it really doesn’t add anything all that exciting and like the campaign mode it has the same spells and you power up the spells by getting tokens which you get by playing in the arena and getting good scores, the arena has 3 modes, one where you defend pinewood from monsters while remaining in one spot only without moving, other mode is red crystals spawn around the map and you have to destroy them cause if more than 8 or 9 get damaged over time you lose, and the last one has you defending 3 giant crystals from monster attacks, the pinewood stage is the hardest because you can’t move, just shoot spells left and right and kill monster before they reach the town, the one with the red crystal was so easy and boring that I let the monster just kill me. It was like 3 to 4 minutes of destroying crystals over and over again while completely ignoring the monster chasing us. And the last one is sort of like the pinewood one only that this time you moved over a large map while defending 3 crystals. Our main problem with the arena is that there’s no music, at least nothing that would get you motivated all the time you’re going to hear constant grunts from the enemy. You can also use and receive card like in campaign mode. Visually the game looks really nice and has the option to play standing or sitting and adjusting heights to a certain height you can even changed it from teleporting to just walking or both, you can even change how you turn if you do sharp instant turns or slowly turn which you can also adjust the speed in which you turn, but personally I got more dizzy slowly turning than instant sharp turns. 2: Too much repeat of the same explore a little get trapped, fight and continue. 3: Needs more spells the amount is not bad but it gets pretty repetitive quickly. 4: Needs better music especially in arena it just doesn’t motivate me and I personally don’t care about leader boards. Overall I give the game a good level of recommendation. 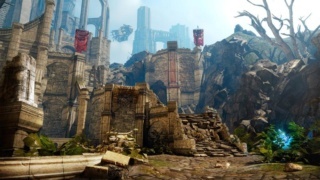 It’s not a bad game, but it could be better, however it’s about the norm for a VR game, I also didn’t comment on the PS Move controller detection cause I don’t have a lot of space where I live so I have to make do but the detection was good just had a few problems with the height making things to low or to high but I think that was more my problem with camera placement than the game. Also for those who care about leader board it should detail better how well you score. This review is now live! As always be sure to leave a comment below! @armerocks What a MASSIVE review! Thanks for the review dude! Nice review, however it was too long. It took over five minutes to read the whole thing.